You can use it safely because the end of the lace up is closed. It is finished well. This review is about item#8415382. 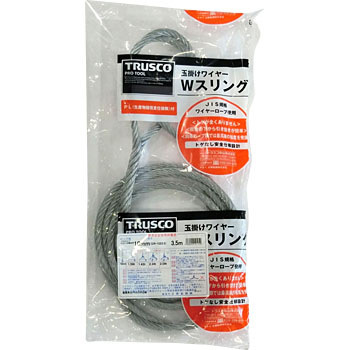 This product is light and can not be twisted, because it is used every day, it is how long it lasts, I am using it for two months now, but I can use it without any problems. This review is about item#8415452. Purchased for use because it wanted enough length for the connection between chill hall and support wood. I was fine. This review is about item#8415461. Correspondence was also quick, supple feeling was supple, easy to use and it was good. This review is about item#08415942. This review is about item#08415513. No kinks occur, efficiently using the bundled wires without protruding. Because it can be compactly stored, we do not take place. This review is about item#08415407. It is used when hanging a load. Very easy to use, I should have bought quickly. It can be used stably. This review is about item#08416003. The knitted part and the aluminum sleeve part are slim than those of conventional use, and it is saved because it becomes easier to pull out from under the packing material. Durability is difficult to judge because it is beginning to use, but the feeling of use is good. I am very satisfied. It was priced and easy to use and firm. I will also use it when replacing. This review is about item#08415443.